Before any of you splendid readers get all shirty on us . 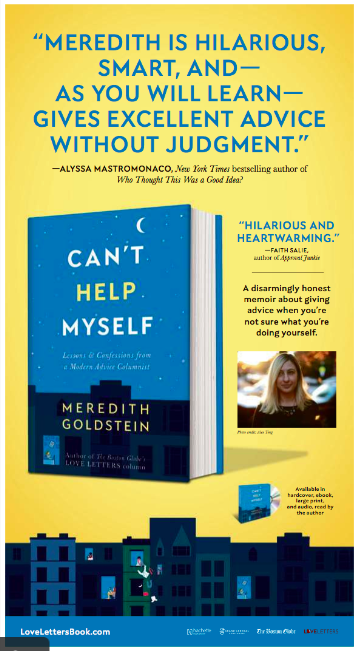 . .
It’s not that the Boston Globe is running endless ads for Names columnist Meredith Goldstein’s new book, Can’t Help Myself. 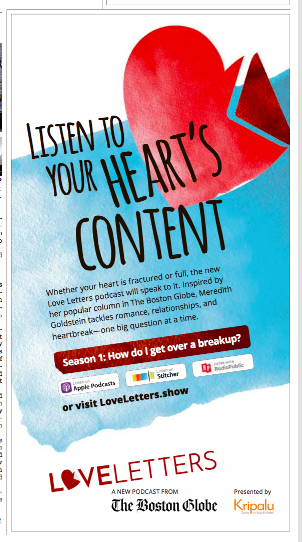 And it’s not that the Globe is running endless ads for Goldstein’s Love Letters podcast. It’s that the Globe is allowing her to promote her book in her own Globe column. Can we at least agree that’s a plug too far? Or is the hardreading staff just hopelessly out of date. To be sure, anyone who’s hopelessly out of dates will likely have a different opinion.